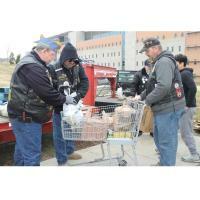 American Legion members distributed several hundred turkeys to local military service members in need last weekend. The American Legion’s Big Red 1 Turkey Run was held at Fort Riley last weekend. The program distributes food to soldiers, including Wounded Warrior Project members, during the Thanksgiving holiday season. Mindy King served on the American Legion committee that organized the event. Her mom and dad began the program in 2008. The program serves Gold Star Family members now as well. Roger Beckley — another program organizer — said members from American Legion branches throughout Kansas helped with the effort. Along with the 550 turkeys, volunteers also distributed other Thanksgiving essentials, including corn, beans, apple sauce and stuffing. The Sons of the American Legion paid for the 550 turkeys on hand. “They foot the biggest bill,” Beckley said. King said the turnout this year may have been slightly lower compared to previous years, but that was probably a good thing for the U.S. Army base.